Review is best for retrieval when done about 1/3 to 1/2 of the way towards the exam. If the test is Friday, learn it Monday, review on Wednesday. If the test is in one hour, learn it ASAP, review it in 20-30 minutes. Pashler’s team discovered that everything has a trade-off when it comes to memory formation. That’s why I push the 10-80-10 model. 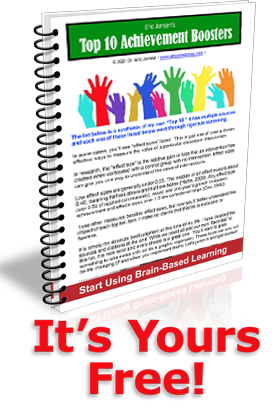 It’s brain-based because it distributes the learning better to include pre and post learning. It works best spread over a whole unit. This means, over any given unit, use about 10% of your time for previewing and priming for upcoming content. Use only 80% of your time on the actual unit, then add the remaining 10% as you blend the content into a new unit. In any given day, you might allocate your time 0-90-10 or 40-50-10 if you realize there are some big gaps in prior knowledge and you must backtrack before the upcoming lesson. But the concept is well researched; SPREAD the learning out over greater time. In the new unit, remember to include 10% of your time on old material or students will lose most all of it. This strategy takes the same amount of time as you are currently spending. But the retention rates and achievement scores will soar! Now this list doesn’t seem all that new. But what was new was something in the last item “repetition.” Seems as if our brain can remember WAY better depending on WHEN things are reviewed. Pashler’s early studies found that if you wanted students to remember something an hour later, the ideal was to review after about 20 minutes. Yet when he did other studies, he found different answers. For example, if students are taught on Monday, and you want students to recall things for Friday’s test, then reviewing 20 minutes after learning, is a bad idea. Reviewing on Tuesday or Wednesday is actually better. But wait, it gets messier before it gets better. If you teach students on the 1st of the month and want students to remember things for the end-of-the-month exam, you need a different review date. FINALLY, it all came together! They were actually studying the effects of 1) spacing (consecutive massed presentations vs. spaced learning episodes like typical classrooms) and 2) lag (less spaced vs. more spaced learning episodes). Analyses suggest that inter-study interval (ISI) effects and retention interval operate jointly to affect final-test retention; specifically, the strategy producing maximal retention increased as retention interval increased. So, Pashler discovered that WHEN you should review depends on when you need to retrieve it! This builds on the research of Bahrick (2005) who discovered that spreading out the learning is a much superior strategy to doing it all at once. This is another perfect example of brain-based teaching! Pashler et al. (2007) Enhancing learning and retarding forgetting: choices and consequences. Psychon Bull Rev. Apr;14(2):187-93.